Santa Maria Coretti Parish. Image courtesy of E. R. Cavaliere and supplied by Adriana A. Davies. The end of the Second World War in 1945 signalled an economic boom for Canada with primary and secondary industries requiring workers. Doors to Italian immigration opened in January, 1947 as war-time measures to restrict movement and rights of enemy aliens ceased. In 1967, new regulations created a point system based on education, occupational skills, employment prospects, age, proficiency in English and French, and personal character. Anyone receiving 50 points or more out of 100 was granted entry, regardless of race, ethnicity or national origin. While urban centres such as Toronto and Montreal were the primary draws, immigrants spread across the country. Labour agents, as in the early part of the century, played a role in recruitment. Canada’s total Italian population increased from 150,000, in 1951, to 450,000, in 1961. Comparable figures in Alberta were: 5,996, in 1951; 15,025, in 1961; 24,805, in 1971; and 26,605, in 1981. Thus, Alberta’s Italian population more than quadrupled in 30 years. By 1996, the number was 58,140 and, by 2011, 88,710. With respect to Edmonton, the 1961 census reported 3,465 individuals with Italian as their mother tongue; the 1986 census reported 9,865 individuals listing Italy as their single country of origin. Unlike earlier immigration eras when men came to make money and return, post-war immigrants came to stay. The critical mass of immigrants began to forge an Italian-Canadian identity and “Little Italies” developed in Edmonton and Calgary. Italian men were employed in construction; the Strathcona Oil Refinery; steel-making and fabrication; meat-packing; the Canadian National Railway; and the civic, provincial and federal civil service largely in labouring and janitorial jobs in public works. Women worked in the garment industry including the Great Western Garment Company; in hospital cafeterias and as janitorial staff; and in retail. While some children (male and female) joined the workforce as soon as they turned 16, a significant number went on to higher education. The push to professionalization occurred within less than a generation. Strathcona Refinery. Glenbow Archives, Imperial Oil Collections, unaccessioned, permission given to Adriana A. Davies to scan them from a booklet in her possession and for the Edmonton Heritage Council to publish. Do Not Reproduce. The desire to purchase homes and establish community institutions became driving forces. Since real estate in inner-city areas was cheapest, Italians bought properties in what became Edmonton’s Little Italy comprising the McCauley and Boyle Street neighbourhoods that extend from 107 Avenue in the South to 118 Avenue in the North, and between 97 and 93 Streets. Santa Maria Goretti Church was built in 1958 adjacent to Clarke Stadium because the Cristoforo Colombo Soccer Club was offered City land and community leaders believed a church was more important than a soccer pitch. Based on hard work and sacrifice, in the 1970s and 1980s, the Italian community flourished. Italian retail businesses developed initially in Little Italy including anchors such as the Italian Centre Shop, Saccomanno grocery and restaurant, and then spread throughout the City. A range of other businesses, particularly in construction, were not based in Little Italy; for example, architect Peter Batoni, who arrived in Edmonton in 1955, grew his small construction company into Batoni-Bowlen Enterprises, a major player in western Canada. Success in the workplace and improvement in a material sense did not mean that Italians ceased to experience discrimination. In this period, Italian immigrants were still viewed as a “visible minority” and many saw them as “enemy aliens” or criminals based on American stereotypes of Mafia crime families. Government policies, however, began to change traditional views that nurtured the distinction between “them” (the immigrant, the outsider) and “us.” On October 8, 1971, Canadian Multiculturalism Policy implemented by Prime Minister Pierre Trudeau, recognized Canada’s diversity, committed to assisting communities to preserve and share cultural traditions, and removed discriminatory barriers. The Immigration Act 1976 made refugees a class of immigrants and acknowledged provincial and municipal roles in successful integration. Liberalizing measures culminated, in 1988, with the Canadian Multiculturalism Act, the first in the world. Under Culture Minister Horst Schmid, the Alberta Heritage Day Act, in 1974, established the first Monday in August as a cultural heritage holiday. The Cultural Heritage Foundation initiated a grants program for qualifying groups and the 1984 Alberta Cultural Heritage Act entrenched support for multiculturalism. Young people perform traditional Italian dances on stage at the Italian Pavilion at Heritage Festival in Hawrelack Park. Image courtesy of E. R. Cavaliere, supplied by Adriana A. Davies. Heritage Festival at Hawrelack Park. Two people dance on a stage before an audience at Edmonton’s Heritage Festival. Image courtesy of E. R. Cavaliere, supplied by Adriana A. Davies. Italian Pavilion at Heritage Festival in Hawrelack Park. Image courtesy of E. R. Cavaliere, supplied by Adriana A. Davies. The impact of this legislation on the building of ethnic pride in Edmonton’s Italian community cannot be understated. Sabatino Roncucci, a founder of the Dante Alighieri Society, collaborated with Minister Schmid from the outset. 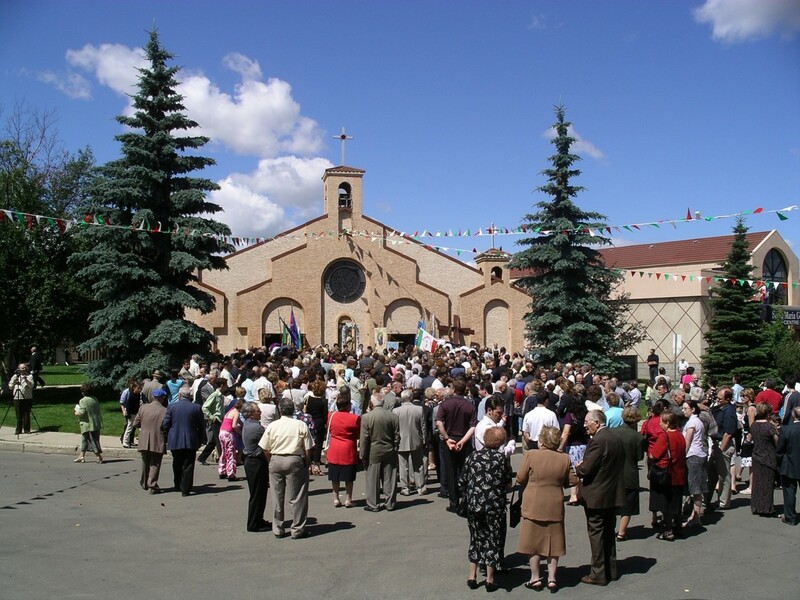 The mandate of the National Congress of Italian Canadians (NCIC), Edmonton Region (established in 1979 to operate the Italian Pavilion at the Heritage Days Festival) included not only preservation and sharing of Italian culture and traditions but also contributing to the greater good. NCIC initiatives included fundraising for earthquake relief; organizing events to fight discrimination; and creating memorials to the contribution of Italians in Alberta (e.g., the Shaw Conference Centre waterfall, an Alberta 75th anniversary gift, and the Legislature grounds monument, a centenary gift). From the outset, NCIC presidents Carlo Amodio, Rudy Cavaliere, Tony Mazucca, Fausta Marazzo, Adriana (Albi) Davies and Sam Amelio were aware that multiculturalism was more than Italian food and dance. The Dante Alighieri Society, next to the oldest Italian cultural society founded in 1961 by Sab Roncucci and its language school with Myra Butti as the first Director and Tony Falcone, the first teacher, was a model for other ethnocultural communities. Roncucci was a founder of the Northern Alberta Heritage Languages Association (1978). Teachers Tony Caria, Tony Falcone and others succeeded in making Italian part of the Alberta curriculum. Principals of the Dante language school have included Antonella Ciancibello, Reny Clericuzzio and Aristide Melchionna. In 1962, teaching of Italian language and literature at the University of Alberta began under Dr. Enrico Musacchio (part of Romance Languages in the Faculty of Arts) and continued under Dr. Massimo Verdicchio. The new confidence resulted in re-naming of Patricia Park in Little Italy in 1981 when a 10,000-name petition, spearheaded by Al Iafolla, was brought to City Council. In the same year, the Giovanni Caboto Cultural Society of Alberta was established and their first initiative was creation of a one-day festival held in Giovanni Caboto Park on the last Sunday of June. These initiatives resulted in creating of the “Little Italy” brand. Giovanni Caboto Park. Image courtesy of Adriana A. Davies. Giovanni Caboto Park. Image courtesy of E. R. Cavaliere, supplied by Adriana A. Davies. But it would take the creation of major new sources of funding to spur proliferation of community facilities beginning in the early 1980s. In 1969, amendments to the Criminal Code of Canada had given provinces authority to licence and operate lotteries and casinos. Funds derived from these sources were dedicated by the Government of Alberta to cultural and community-building purposes. The Alberta Lottery Fund allowed the Government to make funding available for festivals and events as well as for building of community facilities. The Italian community benefited from these government initiatives. The Italian Cultural Centre, Santa Maria Goretti Community Centre, Piazza Italia Seniors’ Residence and the Ital-Canadian Seniors Centre were built. The number of Italian societies grew to more than 40 by the early 1990s, many based on the region of origin of the group. A desire to document Italian community history also emerged. The Dante Alighieri Society, in 1973-1974, undertook an oral history project with pioneers. The Italians Settle in Edmonton Historical Society, established by Father Augusto Feccia, in 1983, to celebrate the 25th anniversary of Santa Maria Goretti Parish, under President Frank Sdao and researcher Adriana (Albi) Davies also undertook oral histories as well as creating an exhibit and publishing a pictorial history booklet. The collaboration between NCIC and the Heritage Community Foundation, under Executive Director Adriana A. Davies, resulted in creation of the multimedia website Celebrating Alberta’s Italian Community. This was one of the 84 multimedia websites comprising the Alberta Online Encyclopedia developed by Davies, who also wrote the Italian settlement history content. Launched in 2002, the website contains excerpts from oral histories including some undertaken for the website. The Ital-Canadian Seniors’ Association, in partnership with Davies and the Heritage Community Foundation, undertook the last oral history project – the “Memory Lane” project, in 2007. Forty seniors were interviewed and a CD-ROM created. Santa Maria Goretti Centre. Image courtesy of Adriana A. Davies. Community identity was also nurtured through a number of communications initiatives. Beginning in the mid-1950s, a series of radio programs ran on CHFA, CKUA and CKER (the first fully multicultural radio station). Early hosts included Frank Spinelli, Joe Bocchinfuso, Lorenzo Bagnariol, Mariano Covassi, Leo Sorgiovanni and Tony De Rose. Il Congresso newspaper, established by Carlo Amodio, Rudy Cavaliere and Alessandro Urso, was the primary print publication. The Il Congresso archives forms part of the Celebrating Alberta’s Italian Community website. Milena Alzetta, Carlo Amodio and Frank Cappellano ran the Panorama Italiano program on Shaw Cable TV. As Canada’s Italian communities gained in confidence, Italian internment in the Second World War was finally addressed. The National Congress of Italian-Canadians and regional congresses (Adriana Davies represented the Edmonton and Alberta regions) spearheaded documentation of this painful history. Over 700 people, the majority male, were interned and more than 31,000 were classed as enemy aliens. In January 1990 a brief was submitted to Prime Minister Brian Mulroney that made the case for an apology and reparations. This followed Japanese community efforts that, in 1988, resulted in an apology and $330 million compensation. The apology came at the NCIC national conference in Toronto in November, 1990. Some were disappointed that reparation had been ignored but most felt that a moral victory had been achieved. There is no doubt that people of Italian ancestry are now part of the mainstream in Albertan society – in business, the professions and the arts. Edmonton’s Italian community today is at a crossroads. The number of Italian societies has shrunk and the three cultural centres continue to operate most with aging boards and volunteers. If they are to serve the next generation, they will need to find new goals and objectives. Canton, Licia, Domenic Cusmano, Michael Mirolla and Jim Zucchero, eds. Beyond Barbed Wire: Essays on the Internment of Italian Canadians. Montreal: Guernica, 2012. Columbus Centre/Villa Charities. “Italian Canadians as Enemy Aliens: Memories of World War II” website, retrieved May 27, 2016. Davies, Adriana, ed. Italians Settle in Edmonton. Edmonton: Tree Frog Press, 1983. ————. “Antiche Radici e Nuova Immagine degli Italiani nel Mondo [Old Roots and New Images of Italians in the World]” In Il Congresso, 1 Gennaio, 1989. A paper presented by Adriana Albi Davies at the Seconda Conferenza Nazionale dell’Emigrazione, November/December, 1988, in Rome. Heritage Community Foundation, Celebrating Alberta’s Italian Community website, Alberta Online Encyclopedia, retrieved May 18, 2016. ————. “Edmonton’s Italian Community.” In Celebrating Alberta’s Italian Community website. Heritage Community Foundation: Alberta Online Encyclopedia, retrieved May 20, 2016. ————. “A Canadian Viewpoint: Reflections on Multiculturalism.” In Il Congresso, 8 Agusto 1988. A paper presented by Adriana Albi Davies at the Seconda Conferenza Nazionale dell’Emigrazione, June 6-8, 1988, in New York. Heritage Community Foundation, Celebrating Alberta’s Italian Community website, Alberta Online Encyclopedia, retrieved May 18, 2016. ————. Black Shirted Fascisti Come to Alberta. Unpublished manuscript, 2011. ————. “The Black-Shirted Fascisti Are Coming to Alberta,” 251-272. In Beyond Barbed Wire: Essays on the Internment of Italian Canadians. Edited by Licia Canton, Domenic Cusmano, Michael Mirolla and Jim Zucchero. Montreal: Guernica, 2012. Immigration Regulations, Order-in Council PC 1967-1616, 1967. Criteria for self-identification of ethnicity in various censuses changed over the years. Nick Lees, “Friends fete Peter Batoni, Edmonton’s king of concrete,” The Edmonton Journal, December 21, 2007. Museum at Pier 21, see summaries of various pieces of immigration and multiculturalism legislation, retrieved May 25, 2016.